GAZA, Nov. 12 (Xinhua) -- Israeli war jets struck with eight missiles on Monday night the building of Al-Aqsa Television, a satellite channel that belongs to Hamas movement and airs from Gaza, the local radio station of Hamas said. 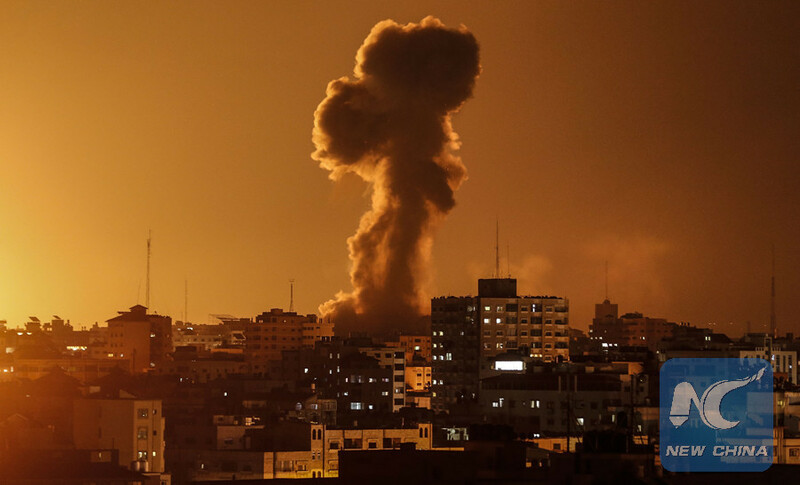 Eyewitnesses, who live in northwestern part of Gaza City, said they heard eight huge successive explosions after Israeli war jets fired three missiles at the building of Hamas-run television channel. The Israeli airstrike on the channel is part of the intensive airstrikes on Hamas, Islamic Jihad and other militant groups in the Gaza Strip in response to earlier firing of barrages of makeshift rockets from the enclave into Israel. Israeli war jets also targeted three houses in the Gaza Strip after asking local residents to evacuate, according to security sources, adding that no injuries were reported in the airstrikes on the TV channels and on the houses. Earlier Monday evening, three Palestinians were killed and nine injured in the Israeli airstrikes on military facilities all over the Gaza Strip in response to firing rockets from the enclave into southern Israel, according to medical sources. Israel army spokesman said in a statement that more than 70 airstrikes were carried out on Monday evening and night on targets that belong to Hamas and Islamic Jihad all over the Gaza Strip. The statement of the Israeli army and the Israeli television "Reshet Kan" also said that more than 200 rockets were fired from the Gaza Strip into southern Israel. At least 13 Israelis were injured with one in critical condition. A joint statement of several Palestinian militant groups, including Hamas armed wing, claimed responsibility for firing the rockets from the Gaza Strip into Israel. They warned Israel in a joint statement that they will expand the range of rockets fired into Israel in case Israel intensifies its airstrikes on the enclave. Tension between Israel and Hamas-led militant groups grew after seven Hamas militants were killed on Sunday night when a special Israeli army force entered into eastern Khan Younis in southern Gaza Strip and killed seven militants.